I just wanted to take a moment to thank you, Jerry for all your help through my Renaissance build. I have to say it's a pleasure you deal with a company that has such great customer service. I'm going to eventually have to order the gig bag to help protect it. Anyway, the custom Koa Renaissance guitar is complete and I'm very pleased with it. Please take a look at the finished photos at this link and feel free to use me as a testimonial or whatever you like. Hello Everyone at Music Makers! I really LOVED seeing the work others have done modifying your kits, reading their explanations, and wanted to share mine as well. For the Renaissance Guitar kit, I had bought a jumbo Irish knot rosette when you used to have them, and took a detail from it which I used to carve the headstock and another detail to create the overlay at the bottom. It's strung as a nylon/classical and I play it all the time. The Irish knot strap I found was a great add-on. I thought that you would enjoy seeing the finished guitar I built from your dreadnought guitar kit. From the moment I opened the box I was impressed with the quality of the woods and components. I added koa wood binding around the top and side dot markers on the neck. The guitar looks and sounds great. Thanks for a wonderful kit that was a blast to build and is fun to play. Remember me? I am the one who custom ordered the seven string kit. Everything was perfect. The guitar sounds incredible. So much so that it has replaced our Martin and Washburn as main acoustic. I have used it on many gigs and always get a million questions as to it's origin as well as compliments on it's sound. Thank you greatly for all your help and expertise. This guitar truly is a one-of-a-kind heirloom. I treasure it in my collection. I just received my spanking new Renaissance Guitar and what a thing of beauty it is! It is absolutely EXACTLY what I was wanting -- the special fingerboard is fantastic, it plays beautifully, has all the right details and the covered machines are an added bonus I was not expecting! Great work! Thanks very much! I ordered a guit-a-long kit last week and I have built it. Woo hoo!! It was a fun experience,and thought it was a great kit. Ten-year-old Lily, needed a project for school that related to the Renaissance Period, so her grandfather, Richard Forsythe, of Buckley, Washington, offered to help her build a Musicmaker's Renaissance Guitar. Click here if you would like to see their pictorial story of construction. 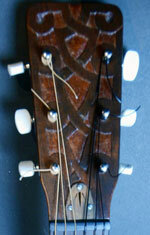 I just received a finished Renaissance Guitar made by you, which I purchased thru 'Lark in the Morning'. it arrived this last Friday, just in time to be used this weekend in the Living History (18th Century Colonial) event we participated in on Mud Island in Memphis, Tn. I must say that the quality in sound, playability, construction, and beauty was far beyond anything i dared to hop for. I've been playing guitar since 1963 and I have picked up only a few guitars (an early 1970's Martin - pre wood warehouse fire model and more recently a Taylor) that were on par with the sound of this instrument. Thank you so much for your fine work. I had a wonderful time playing and demonstrating with this instrument and I look forward to using it in more ways than I originally intended. I will be ordering instruments from you again. Thank you again, best wishes and keep up the good work.